There's nothing quite like a cruise ship. Isolated from land and (usually) cellular reception, it is a guest's all-encompassing floating city, entertainment venue and home. Now cruise company Carnival is attempting to capitalize on wearable tech to streamline nearly every aspect of cruising. Carnival's new wearable Medallion can be worn as a bracelet or carried in a user's pocket, and works with a corresponding system called Compass. This can be accessed as an app on a mobile device, tablet, or computer, or through stations in staterooms and in public areas throughout the ship. Currently installed on Regal Princess, the ship will take its first Compass-equipped trip to the Caribbean in November. It's not a coincidence that two of Carnivals' "Experience and Innovation" execs who helped develop the system were formerly with Disney, which spent years developing its MagicBand wristbands for Walt Disney World in Florida. "The goal wasn't to create a wearable necessarily, it was to look at the experiences on the ships and identify the elements of the experience that could improve and innovate a way to do that," said Michael Jungen, vice president of design and technology at Carnival. After embracing VR last year, MSC Cruises is also taking wearable tech on board with its connected bracelet. The smart wrist-worn device will enable guests to make dinner reservations, book shore excursions and get recommendations for things to do based on personal preferences. It'll also help you navigate the ship and will offer updates on shipboard activities. Expect to set sail with the bracelet from June. Announced in 2013 and in the works for years before, MagicBands are Disney's wearable that work within a complex network of sensors located within Walt Disney World. Using radio frequency technology, the MagicBands connect guests to their plans, including reserved ride times and other entitlements. Guests tap their band to touch points in places such as resort room doors, theme park and water park entrances and FastPass+ entrances. Universal announced that its Volcano Bay water park in Orlando, opening sometime this year, will feature a wrist wearable called TapuTapu that allows guests to virtually queue for lines while they play in other areas of the park. Users can also tap TapuTapu on sensors to create special effects, like controlling streams of water or shooting water cannons. He says the medallion has been in the works for a little less than three years, since shortly after the arrival of new CEO Arnold Donald in 2013. In contrast to developing a wearable for buyers who are already comfortable with technology, Carnival had to create a system that would be straightforward enough for the tech averse. "It isn't just for the tech savvy," said Jungen. "We spent an inordinate amount of time to make it intuitive, seamless, immersive and playful. We reduced the amount of text and options in some cases to make it intuitive and easy to use." Carnival is betting that Medallion and its accompanying app Compass will make it easier and quicker to spend money aboard their ships. It will be linked to guests' credit cards, and guests will be able to buy things that will then physically appear in front of them or easily sign up for excursions. It will show users the itinerary for the day and all the events they can go to. It will keep track of their purchases and preferences, and offer them personalised items, even let their waiters know what they're allergic to. Users can even gamble with their Medallions, either in the casino, or through Compass on their personal device. To track cruisers on a moving ship accurately, Carnival needed to build a sophisticated system, what it is calling a ship positional system (SPS). Though they use GPS to track the ship (which will allow them to pass on information about what people can see from the boat in real time) the Medallion instead relies on a vast network of over 7,000 portals installed all over the ship. As portals sense a Medallion, Compass understands where the user is. Since each stateroom also has a portal, it can even track someone as he or she walks down the hall. Compass communicates with mobile devices via Wi-Fi, which will be provided for Compass by the ship. "You won't need a connectivity plan," said Jungen. 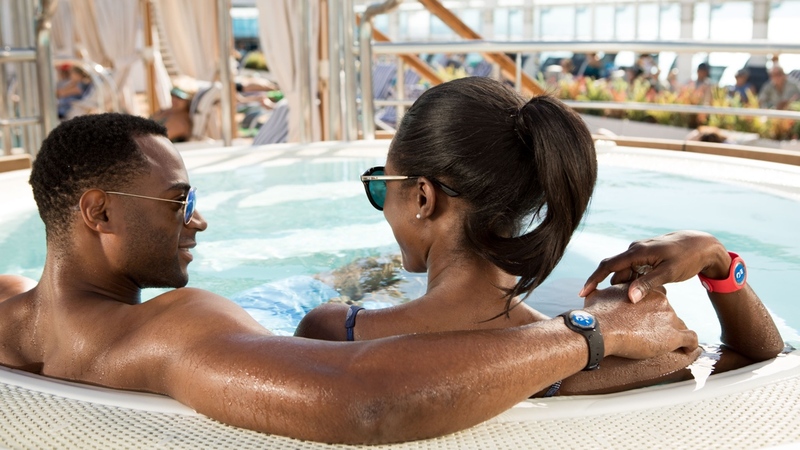 "And we also made incredible investments in upgrading the ship's Wi-Fi capabilities, which will ensure every guest can be continually be connected to the compass." Though users will be able to turn off the function that allows other people to find or communicate with them, some people will undoubtedly still be concerned with Carnival's ability to track their every move. But besides extensive security measures, triple encryption and the fact that the technology is proprietary to Carnival, the tracking is what makes some of the coolest features possible. For one, families and other groups will be able to track each other and message coordinate through the app. "Every parent will be able to not only keep connected to where their kids are but also who they're interacting with and the circles they're engaging in," said Jungen. "While your eight-year-old may not be able to block mom from tracking him, adults will have the ability in their preferences to share or not share the fact that they love being in the casino or wherever they are." Compass will also feature an intuitive navigation tool, that, like a driving app, will direct users to a person, event or place of interest. It will even navigate users around heavy foot traffic from people going to special events. From a service perspective, it also means waitstaff will be able to locate guests easily. So, a guest can order a drink next to the pool, and even if he or she moves, someone will still appear with their order. Another cool feature is called Constellation and will replace the traditional photo walls of the past. Guests used to have to scan a wall of physical photos to find themselves, and deal with the embarrassment of having oftentimes goofy family photos displayed in public. Now Constellation will automatically pull up guests' images on a huge screen, as well as images of the people they've been hanging out with. "We wanted to preserve the social aspect while connecting it to your images and all these other experiences you had," said Jungen. "So Constellation will show you pictures of other people too, like the other family you ate with or people you sang karaoke with for two hours after dinner." Carnival is betting that all those tech upgrades will pay off and isn't wasting any time upgrading its entire fleet of 103 ships. The Regal Princess will be outfitted and set sale in November, followed by The Caribbean Princess in spring 2018 and Royal Princess in 2019. Beyond that, connected cruise ships could be the project which provides a blueprint for how we can interact with real resorts, events and even entire smart cities in the future.